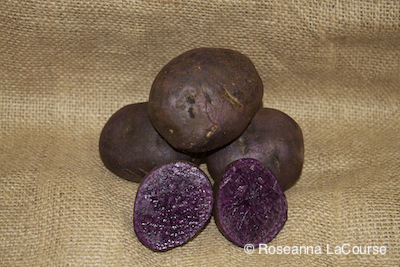 Majestic purple flesh inside satiny purple skin beautifully describes this newlyreleased variety from Colorado. All Blue crossed with a white fleshed chipping variety has produced a royal potato exceptionally high in anthocyanin, an antioxidant. Oblong tubers make stunning chips or fries. Resistant to most viruses, susceptible to fusarium dry rot. Ideal for early market or summer eating; good for short-term storage only. Sustainable Seed.